The determination of ash content is an important test procedure, performed in thousands of laboratory each day, for process and quality control purposes. The new Milestone PYRO is an advanced microwave muffle furnace, suitable for many applications including ashing, sulphated ashing, large scale ashing, loss on ignition (LOI), residue on ignition (ROI), and fusion. The system is available in 3 interchangeable configurations – high sample throughput, ultrafast heating, and sulphated ashing making it a highly efficient alternative to conventional muffle furnaces. While ashing is a relatively simple procedure, it is time consuming and often requires hours to be completed. Microwave assisted ashing offers dramatically reduced ashing times coupled with reduced operating costs whilst using identical ashing conditions to conventional muffle furnaces. 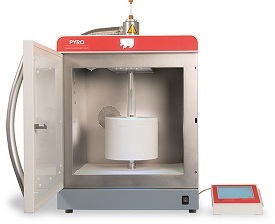 The PYRO with High-Throughput Setup accommodates up to 24 Milestone quartz fibre crucibles. A unique, rugged, solid ceramic muffle allows microwave radiation to pass through and rapidly raise the temperature of a silicon carbide plate in the top of the muffle. This ensures even temperature distribution across every sample regardless of the position inside the muffle therefore providing reproducible ashing results as cold spots are eliminated. Sample crucibles are placed on a large clean quartz plate and an airflow is provided by the integral exhaust system. A porous ceramic honeycomb frit built into the wall of the muffle furnace allows a constant stream of air to pass over the sample crucibles. The combination of microwave “superheating” and induced airflow results in a dramatic reduction of the ashing time. The PYRO with Ultrafast Setup has an extremely fast heating rate. 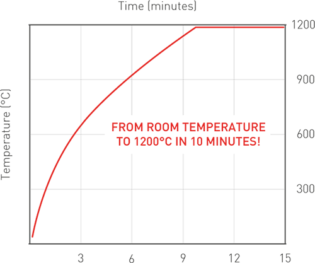 A typical ashing temperature of 800°C can be reached in just 5 minutes from ambient. This eliminates the need of running the system overnight and avoids the lengthy heat up time associated with electrical resistance furnaces, dramatically lowering the power consumption and cost. It also provides the ability to ash urgent samples in a shorter time frame than previously possible. 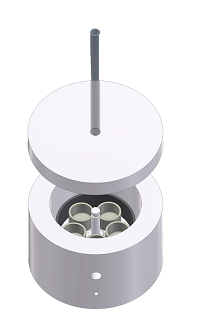 A circular heating element for each crucible ensures perfect temperature uniformity throughout the cavity and across each sample, largely exceeding requirements of ASTM, USP, SEMI and ISO standard methods. Temperature is monitored and controlled up to 1200°C through a contact-less infrared sensor. 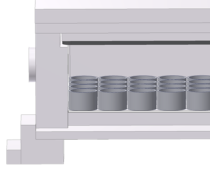 Up to 5 crucibles are located on the ceramic tray that can be easily removed from the muffle on completion of the microwave run. The incredibly fast heating rate combined with the properties of the Milestone UltraFAST crucibles, makes this configuration the best choice for all high-temperature applications requiring minimal heating and processing time. 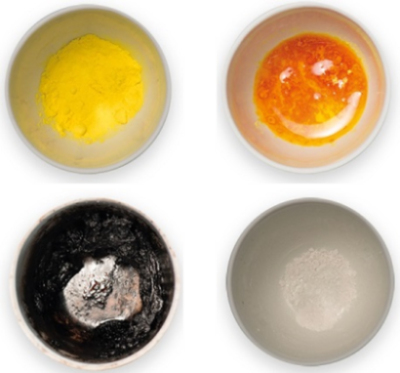 Ashing of pharmaceutical, polymers, and food samples often involves the use of sulphuric acid and results in the release of corrosive vapours during the process. In addition, sulphated ashing methods are labour intensive and time-consuming, requiring manual fuming of the acid and up to 12 hours to be completed. The PYRO with Sulphated Ashing Setup enables the analyst to add sulphuric acid to samples and directly place crucibles into the microwave muffle furnace, without a preliminary charring step. The system follows a preset temperature profile that includes the charring and ashing phases automatically so there is no need to remove the crucibles during the process. Sulphuric acid fumes released from crucibles are continuously removed through an integral exhaust and pass through a quartz tube and an air-cooled quartz collection vessel outside the unit. The fumes are finally contained and neutralised in a dedicated acid scrubber module so operator exposure to acid fumes is totally eliminated. The UltraFAST crucibles are made of an innovative chemically and thermally resistant material allowing the samples to be surrounded by a constant airflow that accelerates the ashing process and reduces ashing times. Furthermore, the cooling time of the UltraFAST crucibles is so short that there is no need to use a dessicator prior to weighing. The UltraFAST crucible cools from 1000°C to room temperature in under 30 seconds and are suitable for the ashing of any solid sample, such as polymers, pharmaceuticals, food and feed, cokes, and coals. The PYRO is controlled by a compact touchscreen terminal with an easy-to-read, bright, full-colour, touchscreen display that provides automatic realtime monitoring and feedback based control. The terminal can be interfaced to external devices including the laboratory network and is preloaded with all ASTM, USP, SEMI, and ISO methods. The terminal runs a completely new user-friendly, icon-driven, software to provide easy control of the microwave run. Simply recall a previously stored method or create a new one, press ‘START’ and the system will automatically follow the user defined temperature. There is no need to input the number of crucibles or sample weights, as the software will automatically regulate the microwave power according to the temperature profile desired. 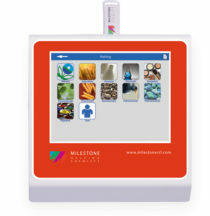 This assures a consistent quality of the results and simplifies the use of the instrument.